Condition Details: Lightly used, new gloves. 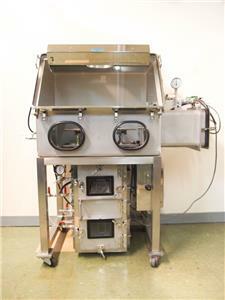 This all stainless steel glovebox is equipped with a vacuum chamber that is located beneath the main chamber. This is equipped with a electric elevation system. The elevation system chamber is also equipped with purge valves. The elevation system has been tested & is working. 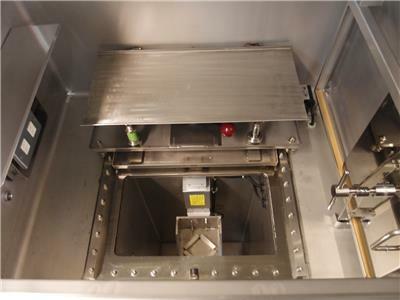 The elevation chamber has a transfer port leading to the main chamber with sliding trays above. We have put new gloves, O-rings, and light on the chamber. 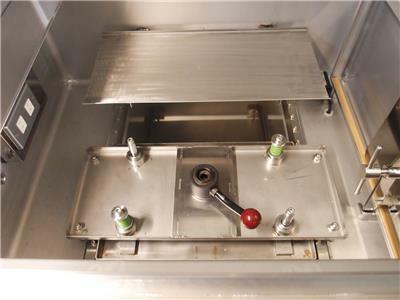 Mechanical interlock equipped on anti-chamber door. 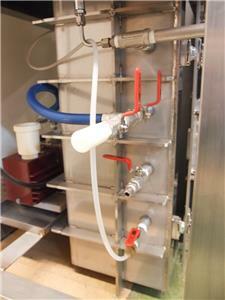 Purge valves equipped on the pass through and main chambers. The vacuum pump on the bottom of the box has been tested and is working. This item is also on wheels for easy movment. 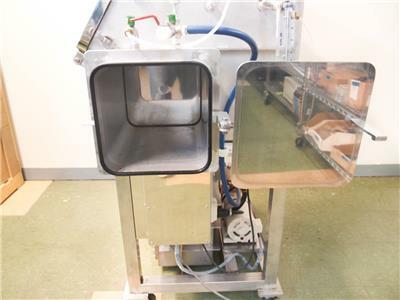 Description: This all stainless steel glove box is equipped with a vacuum chamber integrated into the lower elevator that can then be purged with a gas of your choice. 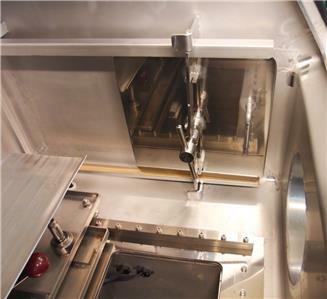 The elevation chamber is located beneath the main chamber which has an electric elevator system operated with a joystick. 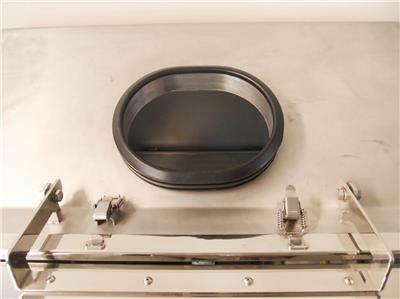 The elevation chamber has a transfer port leading to the main chamber with a sliding tray above. 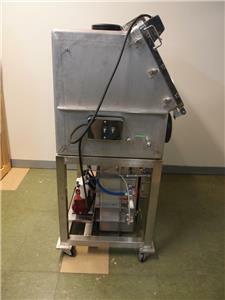 The main chamber can be purged with a gas of your choice. 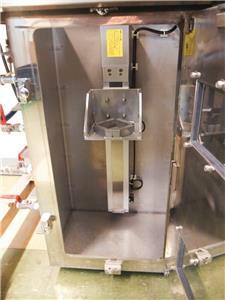 Project item may be removed through inter-lock door which also has vacuum purge capability. 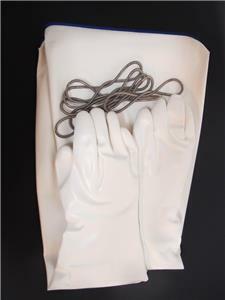 We have put new gloves, O-rings, and light on the chamber. 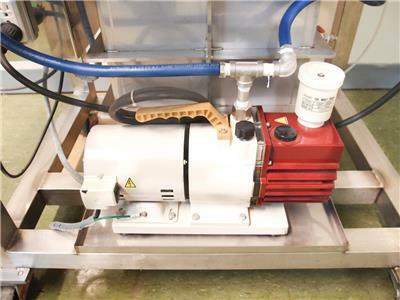 The vacuum pump has been tested and working. This system is on wheels for easy movement. 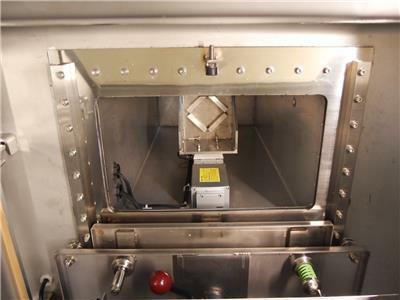 ?Elevator Port Size: 10.5" x 9.5" x 22.5"
Front Door: 29.5" x 15.5"
Inside Chamber: 32" x 23" x 25"
Side Port: 9.5" x 9.5" x 14"
Entire Glove box: 52" x 29" x 59"